Banbury proved the doubters wrong last year and Lloyd Sabin feels they could be the surprise package this time. Sabin’s first year in charge at White Post Road started with him having to rebuild the squad following an exodus the previous summer. He did and a fourth place finish in the Counties Premier Cricket League was a good starting point for his new-look side. Sabin feels his squad is better equipped this time to offer a genuine challenge to the top clubs. Banbury’s opening division one fixture is at champions Henley but that holds no fears for Sabin. He said: “It’s a tough start for us but we’re looking forward to it, we’re in a good place at this stage. We’ve trained hard during pre-season, done what we can despite the weather conditions, and we’re ready to go. The overseas player at Banbury this year is Qaasim Adams, a 34-year-old left-handed batsman who can also bowl seam and is contracted with Cape Cobras in South Africa. Two Slough players have joined the club: Steve Green, a left-arm spinner, and wicket-keeper Shazad Rana who will replace Will Hawtin. Coming in from Horspath is Graham Beer who is a left-arm seam bowler and lower order batsman. Sabin said: “I feel we’ve got a nicely balanced squad this time. Now it’s up to the players to take on a bit more responsibility than last year so that we can improve again. 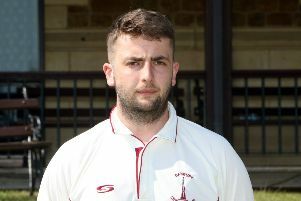 “Several of those from last year were good enough to play at this level but they hadn’t played Home Counties Premier Cricket League week-in, week-out. “We’ve got the bulk of last season’s squad and most of the players have got a lot more games under their belt. “Last year a lot of people thought we would struggle and saw us as relegation candidates. But we showed that we can be a good team and I’d back us to be more dangerous this time. “On paper we didn’t look strong last year but we performed well on the pitch. This time we look stronger but that means nothing, it’s up to us to perform better than last year. “There were no expectations on us last time and we’ve not set any targets for this year. The only expectation is coming from the players themselves, they want to do better, it’s how they deal with any extra pressure.